Generate images with reflection effects. Is there a better alternative to Easy Image Reflection 2? Is Easy Image Reflection 2 really the best app in Image Editing category? Will Easy Image Reflection 2 work good on macOS 10.13.4? Drag-and-drop your image onto the window. Adjust the distance of the reflection by moving the Distance slider. You can also adjust the spacing between the reflection and the original image by moving the Spacing slider. Added workaround fix to bug in TextEdit on OS X El Capitan that causes a crash when the Action Extension passes TextEdit back an image. Easy Image Reflection 2 needs a review. Be the first to review this app and get the discussion started! Easy Image Reflection 2 needs a rating. Be the first to rate this app and get the discussion started! Easy Image Reflection 2 is OS X Yosemite ready, bringing the brand new "Easy Image Reflection 2" Action Extension! You can now add reflections to your images in any OS X application that supports Action Extensions on OS X Yosemite (such as TextEdit)! Add a reflection to images. Allows you to adjust the distance of a reflection. Allows you to adjust the spacing between the source image and the reflection (NEW in Easy Image Reflection 2). Allows you to adjust the intensity of the reflection (NEW in Easy Image Reflection 2). 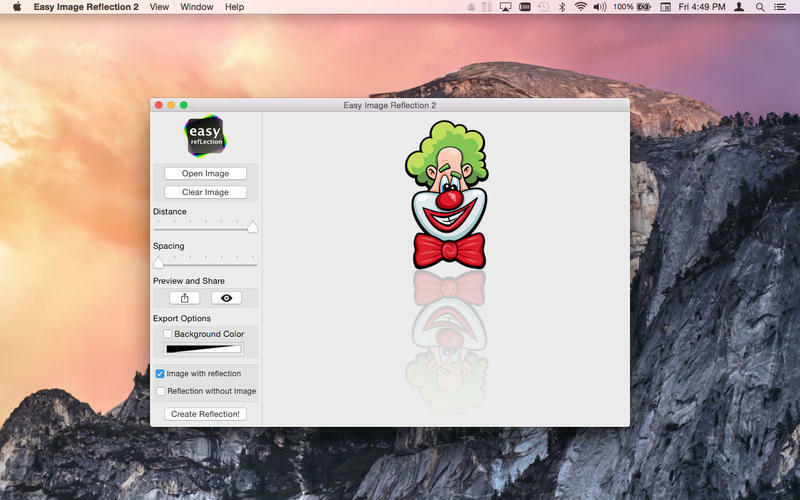 Allows you to save your image with a custom background color (NEW in Easy Image Reflection 2). Allows you to add reflections from OS X applications that support the new Action Extensions on OS X Yosemite (NEW in Easy Image Reflection 2). Share your reflections easily on social networks.